"The Vineyard is a perfect place for us." We are thrilled to be launching our 2013-14 season with the world-premiere of John Kander and Greg Pierce’s THE LANDING. This stirring and haunting new musical is comprised of three distinct and thematically connected pieces, and marks the first collaboration between legendary theatre artist John Kander, author with the late Fred Ebb of such groundbreaking musicals as The Vineyard’s THE SCOTTSBORO BOYS, CHICAGO, and CABARET, and the gifted young playwright and librettist Greg Pierce, whose play SLOWGIRL premiered to acclaim at LCT3 last season. The Vineyard has been developing THE LANDING with them and a core company of actors over the past two years, including a developmental lab production last season. John Kander and Greg Pierce recently spoke with THE GRAPEVINE about the inspiration behind THE LANDING, their methods of collaboration, and what they are learning from one another. GREG PIERCE: We both went to Oberlin College, at different times. John came back to Oberlin and became a mentor to a handful of students who were moving to New York to pursue careers in theatre. I was lucky enough to be one of those students, and so when I came to New York, John and I would get together occasionally. I would come to readings and workshops of his pieces, and he was reading my short stories and plays. We were good friends for about ten years before we started working together. When or how did you decide to collaborate with one another? JOHN KANDER: It was gradual. There are writers that speak to you and make you want to read more and more of what they’ve written, and that was Greg almost from the first thing I read. I really admired and felt a connection to what he was writing almost immediately. After THE SCOTTSBORO BOYS and a number of other big shows, I started thinking about doing a piece that would be in a form so small that you could do it in your living room. I called Greg and asked if he wanted to work on it together. How did you embark a method of working together? Did you have an instant collaborative chemistry or did it evolve more slowly? JK: It was pretty instant, I must say! When we started, we were finding out about each other, but I think I knew pretty much right away that we would be able to work together. Once we decided we wanted to try to do this, we sat down together and started playing a game I call “what if”: you’re in the room making up a story together and you say, what if this happened, or what if that happened, what if there’s a mother and a little kid, and so on. We discovered very fast that we were both good “what if” players, and we began building a story in just that way. As a matter of fact, it’s what we continue to do today, and we’ve just started writing our third show, so I think it’s working for us. GP: I didn’t know what to expect in terms of our collaboration: I had never written a musical before, and John has written 20,000, so I thought of him as knowing a lot more than I do. But, what I found was, from the beginning, we would put an idea out, and the idea would exist in the room separate from us, and separate from our resumes or our experiences. Suddenly it was just this thing that was evolving, and that was really exciting to me. It’s always been like that in terms of our collaboration; it’s always felt very equal and been about how to improve the idea and the story, not about who’s doing what. THE LANDING is made up of three pieces, “Andra”, “The Brick”, and “The Landing”. The first, “Andra” is the first piece you wrote together. Can you talk about what inspired it? GP: The idea of wanting to create a very small chamber piece came before anything. We were also both very interested in the idea of a narrated piece, so that there’s almost a “once upon a time” or storybook quality. When we were writing ANDRA, we very early hit on the idea of stars, and specifically how the same stars mean different things to different people. John talked about how much a certain star meant to him while he was at sea, during the War. From there we played with the idea of someone teaching someone else about stars, and how passions can be contagious. Did you conceive of an evening of three pieces from the start? GP: No… we started working on “Andra” and it very quickly became a one-act. Then we got excited about the idea of creating an evening of pieces, that were tied together loosely, thematically. Aspects of all three stories were inspired by their narrators. We knew we wanted to play around with various kinds of third person and first person narrators, so once we figured out who was telling the story, the what and the why often followed. JK: Once we wrote “Andra”, we had four characters — a man, a slightly younger man, a woman, and a boy — and we knew we wanted these four people to do the whole evening. With the next two stories, we would start with an idea we were interested in, and find the characters from these four types. Thematically, I think in each of the three stories, people get what they want, and it doesn’t turn out to be quite what they expected. You’ve been developing this piece at the Vineyard since early in its process, and three of the four actors – David Hyde Pierce, Julia Murney, and Paul Anthony Stewart – and the music director, David Loud, have been part of that process from early on. Can you talk about the experience of developing this piece with them? GP: It has been amazing… developing this piece with the same people and having a room where we could truly be collaborative, and where everyone just really respects each other and wants to make something great. And then the time between workshops and the lab to take what we’ve learned and work on it. John, do you tend to write music first and then, Greg, you write lyrics? Or vice versa? GP: I don’t think we have any one method, really. In the beginning, I was writing lyrics and giving them to you, John. And now we’re doing whatever feels right. I’ll write a lyric or John will come up with a melodic line or a chorus; whoever has a vision for a certain moment. The voice memo function on our iPhones has saved our lives because we can record little things and send them back and forth. Greg, had you written lyrics before? GP: When John asked me to write “Andra”, I was not thinking that I would be writing lyrics, because I had never done it before. The original plan was for you to write them, John, because you had written them for CURTAINS and other shows, or we were both gonna do it. GP: I find now that it has really influenced my writing. I’m more about economy of words, sounds of words, rhythm. JK: Well, you write very musically. Which I think is probably one of the things that attracted me to your writing in the first place. I’m a sound man more than a look man. I tend to hear what I’m reading, which is not always an advantage. But I found that when I read Greg’s stories, even before we started writing together, I was hearing them while I was reading them. There was, I think without intention, probably, so much poetry in the writing itself. How did you approach finding the musical vocabulary of the show? GP: We were trying to invent a language other than traditional songs and scenes for these pieces. In THE LANDING, sometimes characters will sing a line, sometimes a verse and the song will come back later, and sometimes it’s a complete song. We approached it as, whatever feels right at that moment, and we learned a lot through The Vineyard lab production about what worked and what didn’t. We have really different backgrounds in terms of storytelling in general, but we’re both passionate about things besides traditional musicals — fiction and plays and operas and classical music — as well as traditional musicals. So I think that informed our desire to have a new kind of form. What was the experience of the lab production like for you? JK: Well, how about starting with, it was a godsend! The great thing about The Vineyard’s lab is that you not only get to rehearse a piece and then put it in front of an audience, but you can change every night if you want. It’s still a piece of clay and it’s a very luxurious way to work. GP: I think in the theatre it can be very good to not just have endless amounts of time to experiment, but to really be working towards a goal and then working towards another goal. At the end of the day, people are going to be in the theater watching this and that makes you try hard quickly to make a piece work. We knew we’d have time after the lab to evaluate. JK: I agree. We learned things about each of the pieces that led us to do a lot of rewriting. But it’s the sort of learning you couldn’t do unless you had the piece in front of an audience. What is one thing that you’ve each learned from the other? GP: John has a wonderful way of writing for the joy of it, because it’s a great thing to do with your life and not because it has to be perfect or even produced. So just the plain joy of doing it, which makes it a lot of fun but is also great for the work, because you don’t feel like whatever comes out right now has to work beautifully. It’s like, let’s just keep playing with it until we hit on something that works. So I learned that from John, and it influences a lot of what I’m doing in the rest of my life: jumping in and doing it, the idea that it doesn’t need to be perfect. JK: Well, that certainly describes the way we work (laughter). Working with Greg has made me think musically in more adventurous ways than I had in the past. As a matter of fact, every once in a while, Greg will write something that will start with a pattern and then go out of the pattern and he will say, I’ll fix that so it fits. Then I’ll find myself saying “no, first let me find some way to make that work”. So he’s led me in a lot of different directions. I’ve learned a lot, I really have. I keep learning. After a productive period of development, the show is now ready for its world premiere. How are you feeling as we get ready to start rehearsals? JK: I’m a little scared. (laughter) I’ve said this to Greg many times, but for me, the real fun is writing, and then, being in a rehearsal room. Knowing an audience will actually come see it is always scary. I’ve never done a piece of work that I thought I knew how to do. And it’s not getting any better. But I mean this very sincerely, because you didn’t ask it: having a theatre which is a home, where you know you have place where people will support you and let you mess around in their basement — it means the world to me. I’ve been in this business a long time, and it’s what I always wanted but never had. Now when I have to bring my shoes back into the other world, when a revival is coming up or something like that, I miss The Vineyard, I really do. It’s a perfect place for us. 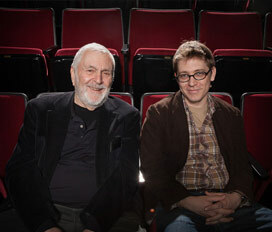 Photo: John Kander and Greg Pierce. Photo by Jordan Hollender.